I often counsel people who are grieving the loss of beloved animal companions. Without exception, they all tell me how much they learned from their animal friends and how deeply their souls were touched by the animal's depth of love and devotion. In my own experience, being touched by animals on a deep soul level is a daily occurrence. I work at home in the company of my cat Lily. Lily has been my companion for eight years now and I am still discovering her many wonderful attributes. Just to see her fur glistening in the soft morning light brings joy to my heart. With her brown and black stripes, she almost disappears into the pattern of the oriental rug. She keeps me company all day, coming to check on me between her outings in the yard. When she feels that I have spent an unhealthy length of time writing at my computer, she sits right on top of it, leans over and licks my forehead to remind me that there is more to life than words could ever say. Some time ago, during a year long illness, Lily was the only living soul who freely chose to stay with me. Born in the alley behind my house to a feral mother she one day decided on her own to muster up all the courage she had and come inside to be my friend. As I watched from my kitchen window she began the long climb up the back stairs to my apartment. Every few steps she would glance tentatively over her shoulder at her siblings far below….but she was determined and continued on. Reaching the door she let me know in no uncertain terms that she wanted in, but that I was not to try and touch her until she herself was ready. It was clear she was on a mission. Save for the company of this little tiger cat I would spend the next year of my life alone. Soon after her arrival, the beautiful tiger kitten communicated to me that her name was ‘Lily’. I sensed the beauty and appropriateness of the name immediately and from that moment addressed her according to her wishes. We lived harmoniously in my small apartment for many weeks without physical contact. And then one day as I lay in my bed, weak and sick, she jumped up onto my chest and settled down as if she had always done so. For the duration of my illness she kept me company as I read and studied spiritual books and the lives of the saints. She loved being with me when I read and would stare at me with a look of deep understanding and encouragement as if keeping a vigil. When I was in pain she would kiss away my tears with her warm pink tongue. Late into the night she purred sweet healing songs into my pillow. Often she had to wait for days for her favorite food, but her devotion never wavered. She would lie on my body where the discomfort was the most intense and pour so much loving energy into me that soon the pain was gone. I have known few human beings of such devotion. After my recovery I immersed myself in researching the mystical language of flowers. It was only then that I came to realize the deep significance of the name Lily. 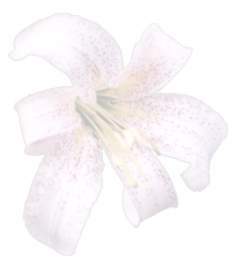 I learned that Lily represents resurrection, purity of intent and spiritual vision. This symbolism is akin to the lotus of the East, which embodies enlightenment. 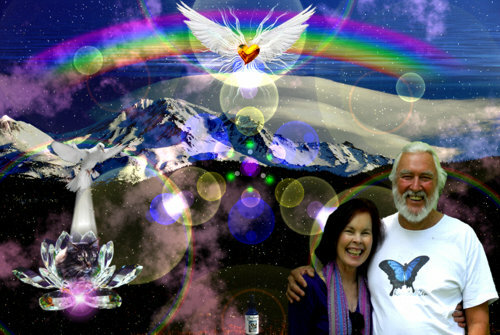 Lily came into my life to hold the vibration of purity, mystical vision and resurrection during a critical turning point in my life that required both Lily and I to release our former lives and dedicate our existence to the service of a higher purpose. During that time we were resurrected together into a life of Grace. All through my life animals have been my wise friends and spiritual companions. Dogs, cats, horses, rabbits, mice, birds and more recently a fox and a coyote. They each had a sacred gift to share with me. Sometimes just looking in an animal's eyes I have been transported beyond space and time to a place as close to God as I can get and still be in a body. 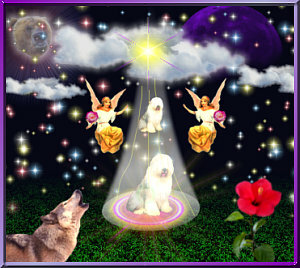 I feel at peace around animals.....safe, warm, companioned, honored, seen and close to heaven. People report having these same feelings around Saints and Sages. It is popular these days to be searching for angels, spirit guides, gurus, twin flames, teachers, therapists, ascended masters, and totem (dead) animals. When not searching for these we attempt to better ourselves by attending workshops, seminars, intensives, vision quests, retreats, recovery groups and Om circles. I fully understand this longing for spiritual guidance, but perhaps we look too far afield, or possibly our sights are too lofty. Maybe we should try looking down for a change...toward the earth! Who is that little furred and bewhiskered friend at our feet? The one who runs to greet us with an open heart no matter how late we come home; who keeps us company when we are sick and feeling ugly; the one who offers unconditional love and who consoles us when all the therapies have failed, our boy friend has left and our check book is empty. Perhaps we should take a closer look...a look through the eyes of the heart. In my own life, animals have been some of my greatest teachers and my life has been profoundly enriched by their presence. From them I have learned about joy, spontaneity, humor, acceptance, surrender, devotion, fidelity, death and resurrection. There have been times when I have envied friends who traveled to far off places to visit gurus and spiritual teachers, but looking back, I have been surrounded by gurus and teachers all along, little furry ones! And when it comes to angels . . . I have begun to realize that many angels have whiskers and wet noses . . . and even those winged ones sometimes have beaks! This morning when I looked at Lily sitting in the morning light, I thought I saw the faint glimmer of win gs and a tiny golden halo set rakishly over one ear. This story was originally written when Lily was eight years old. She is now 23 and approaching her transition from this life. Although frail, hard of hearing, and nearly blind, Lily remains the perfect embodiment of he namesake and I am finding that her final lesson to me…the lesson of a graceful passage from this earthly plane…. her most profound lesson of all. The Sufi mystic Hazrat Inayat Khan has said: “death is the crescendo of life.” In this statement he echoes all of the great saints, sages and mystics who speak of the importance of preparing for a conscious death. When first encountered, the idea of dwelling on death, especially in our Western culture, appears to be life negating. Death, however, is the very moment all of life is preparing for…like the crescendo of a great symphony. Few of us will embark on such a path voluntarily, the fear of death is too paralyzing, the distractions too great and the dearth of support sparse. I am leaning from Lily that the solitary task of providing her with a sacred final passage is introducing me to the mystical aspect of death. As I focus on returning to Lily all she has given to me my awareness is turned back upon itself as my beloved friend and I meet soul to soul in deep sacredness beyond words. At this moment Lily is the guru and I the disciple. Together we tabernacle with God in the sacred silence of our shared heart. Each day in that inner tabernacle we behold a God of limitless compassion and mercy, a God who cares equally for all creation from the tiniest insect to the most advanced mammal and who is the very soul of souls. Together we ride the crest of the wave of the present moment opening to the clear reception of the still small voice of truth arising from within our own hearts. All that we need to know to fulfill each moment is revealed. Lily is teaching me that such a scenario provides an opportunity to receive the greatest gift our beloved animals have to offer, a dress rehearsal for our own final passage. Beginning the day Lily made her way courageously up the back stairs of my apartment to the present moment I have been slowly reborn, and she has been the midwife of my rebirth, the Angel of the Presence of God in my life. I hope to return in full measure the gift of her life by holding the essence of the “Mystical Lily” for her during this time by applying all I have learned from her over the years as well as through her direct tutelage as her transition process unfolds. When she breathes her final breath I will see her safely to the tunnel of light where the angels will receive her as one of their own. And if I have learned her lesson well, when my own death comes calling I will greet it with grace and fearlessness knowing it to be none other than God Itself enfolding me back into Her embrace.